April 23, 2019 by DE Staff Festo’s DHEF gripper mimics the action of a chameleon’s tongue to pick up almost anything. 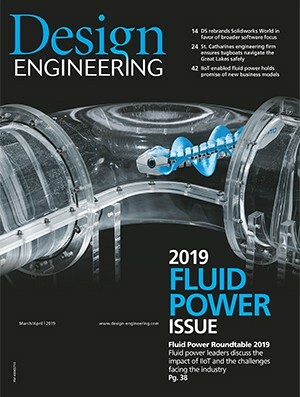 April 16, 2019 by DE Staff Pepperl+Fuchs’ ENI58PL configurable incremental rotary encoder offers efficiency for a wide range of applications. April 16, 2019 by DE Staff AutomationDirect’s IDEM snap-action limit switches suitable for a wide range of operating conditions. April 10, 2019 by DE Staff Bison Gear & Engineering Launches VFsync, a Next Generation Permanent Magnet AC Motor. April 10, 2019 by DE Staff OmniVision 2MP RGB-IR OV2778 provides industry’s smallest cabin monitoring sensor. April 2, 2019 by DE Staff Miki Pulley BXR-LE brake provides more stopping power using less space. April 2, 2019 by DE Staff Balluff BNI00E1 and BNI00AZ IO-Link masters provide flexibility in designing controls architectures. March 27, 2019 by DE Staff igus drylin ZLW econ designed to reduces automation costs.